Put Glamor and Camping together to get Glamping! 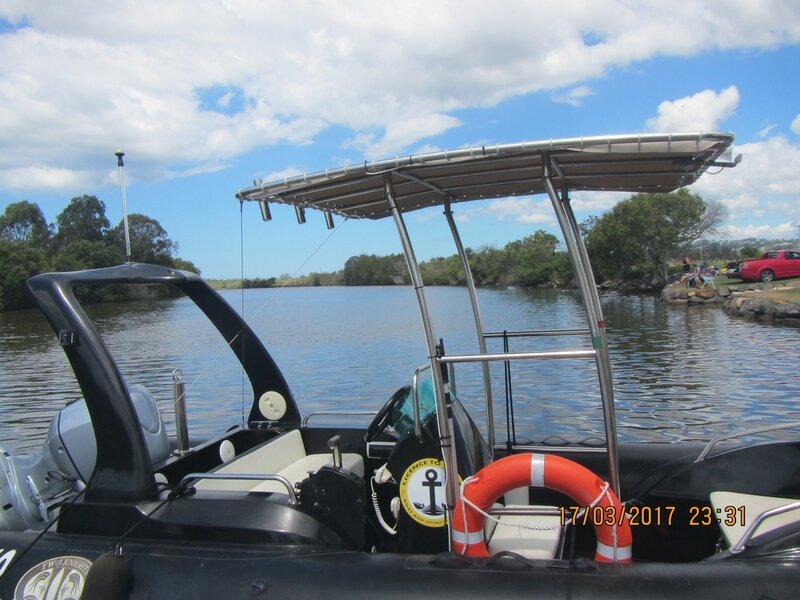 ​Although one in 15 Australian families own a caravan or motorhome and thousands more drag out a tent every now and then, one of camping’s perceived drawbacks for many is they don’t like leaving the comforts and luxuries of home. 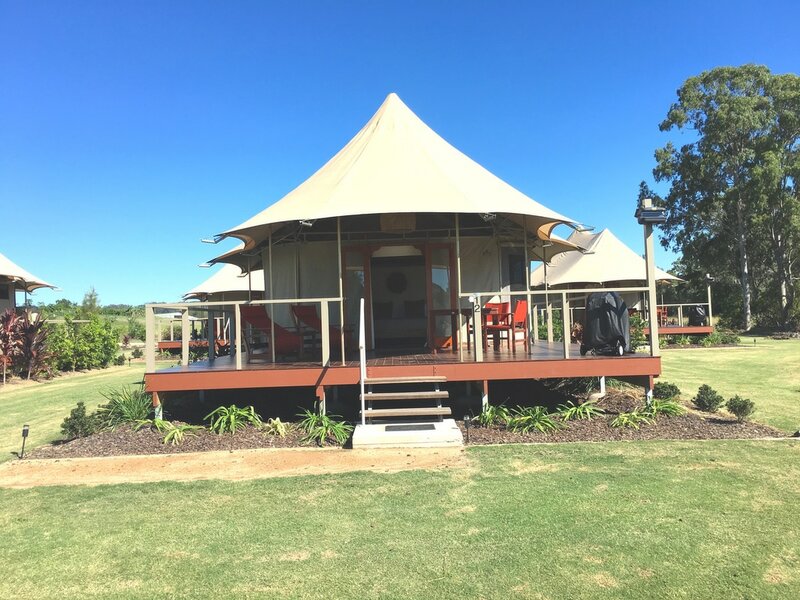 Australia’s newest camping facility on the banks of the Petrie Creek on the Sunshine Coast has removed that concern by putting glamour ahead of camping to create glamping, a new style of resort camping holidays with families in mind! 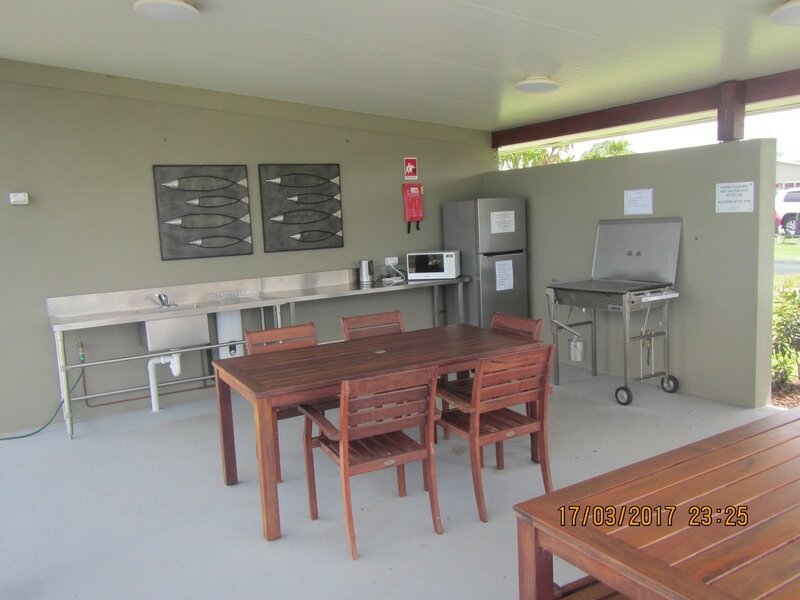 Rivershore Resort is the first new caravan park built in Queensland in 30 years and takes the “rough and ready” out of getting away for a relaxing break. We managed to spend a couple of days there in our motorhome while other members of the Holiday Destinations team tested one of the 15 safari-style tents – WOW! The 80 powered camping sites were huge compared with many parks around the world (the previous day at a different park we could almost hear the neighbors snoring!). Our eight-metre motorhome took up only about a third of the available space. Roads were sealed; despite really heavy rain for several days the grassed sites were well-drained and firm underneath; and the resort facilities were the best we have ever seen. The park was created by retired developer Bernie McGovern and his two sons Bernie Jnr and Will and his wife Hailey help run it. But it is easy to see where Bernie’s wife Cathy had a solid input into the design, providing a refreshing, caring touch of quality and nice! 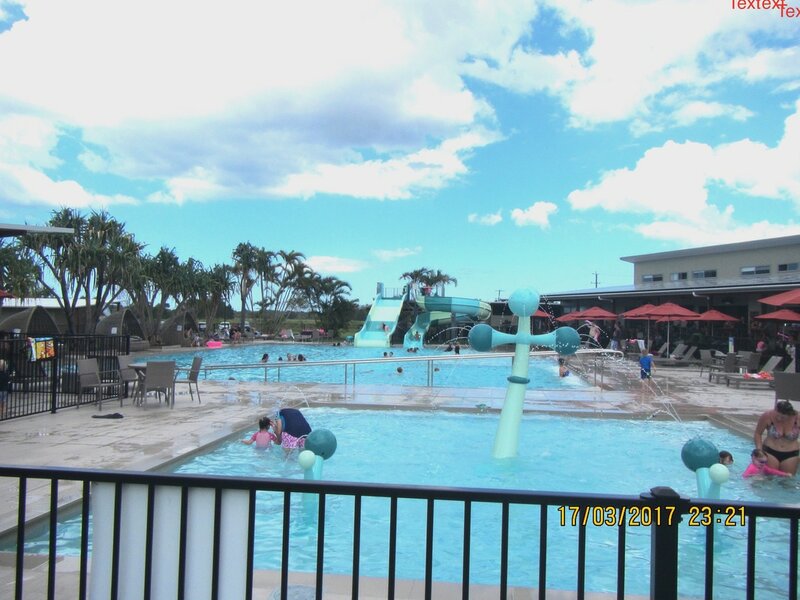 It is easy to see why the Big 4 group welcomed Rivershore Resort into its fold, as the design centres around a family water park theme with a huge fun pool (25m x 18m) heated by a similarly-sized solar power system and freaturing two water slides, spa jets and a well-planned 8-metre x 8-metre toddlers pool with lots for the little ones to enjoy. This is all adjacent to a large kid’s playground that puts many fast-food and council play areas to shame, simply because it has lots to do (much of it educational) and has plenty of sand to land or play in, rather than gravel or woodchips! One side of this whole area is encased by an 80-seat indoor/outdoor/pool deck café, restaurant and licenced bar; conference and administration centre; and a modern, stylish amenities complex. 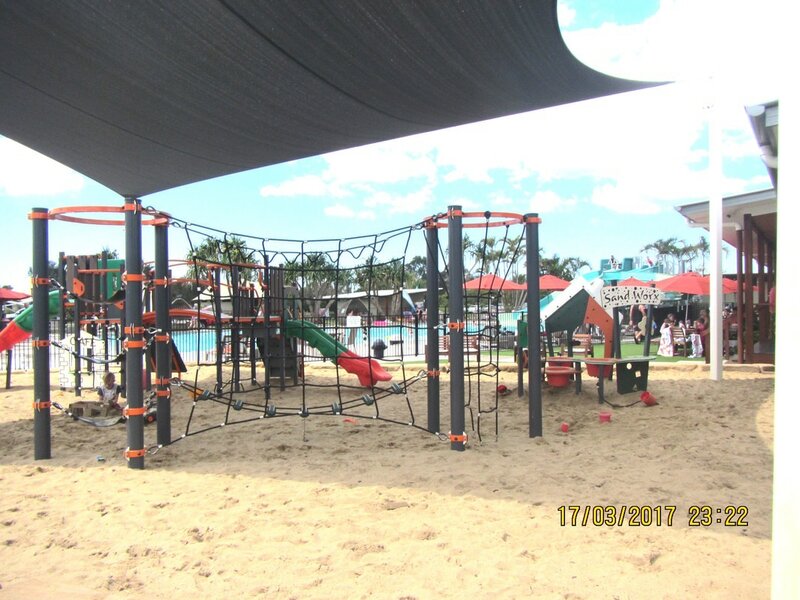 There is also a large outdoor inflatable jumping cushion, mini golf and fun recreational equipment such as bikes, kayaks and canoes available. On warmer nights there are free outdoor movies and regular soccer games or yoga sessions are organised. Spread around the resort are excellent camp kitchens and modern amenities blocks, all topped off by a great boat ramp, jetty and nice fishing area, In fact other visitors caught plenty of mud crabs, whiting and perch on the first night, despite the wide flowing creek being a little dirty from the heavy rain. While there is free WIFI, powered sites are metred and electricity usage is PAYG, which is fair enough because a family having fun in a tent and using the resort BBQs and amenities probably shouldn’t have to subsidise air-conditioned vans and motorhomes! While you can still go a pitch a tent (or they will set one up for you in advance), six months into the Resort’s life the novelty of glamping may have worn off but passion for the 13 King and two Family luxury safari tents has not – the place was booked out. The luxurious safari tents have been designed and built to impress, and that they certainly do just that from the minute you walk onto the spacious open timber deck with table and chairs, outdoor lounge chairs and a nice BBQ and a view across a large grassed area to the mangroves along the riverbank. Once you step through the double doors there is a stunning four-poster king bed with subtle, naturally-toned surrounds that instantly erases any stresses you may have tried to bring with you. Step behind the partitioned bedroom and there is a kitchenette and wardrobe area that leads to a spacious and tastefully-created ensuite with shower, free-standing bath, toilet and much more, all finished in timber and earthy tones. While it was stormy, humid and a little muggy while we were there the tents were cool and charming with ceiling fans and plenty of netted curtains to open and catch the cooling breezes. While there are no aircons in the tents, they do come complete with smart TVs and high speed wifi for those who can’t cope without technology. Despite all the newness, glamour and luxury, one of the most outstanding features of this park is the staff, from the welcoming smiles of Natasha and the other staff in reception to everyone we met across the resort. From the earnestness of the young student serving coffee; the obvious joy shown by housekeeping staff as they went around the resort; and even in the firm manner in which Bernie Snr ensured a couple of young lads didn’t misbehave in the pool, the whole place oozes with kind and happy people. It’s infectious and across two whole days all we heard from everyone was laughter and the sounds of happiness, which after all is what holidays should all be about.